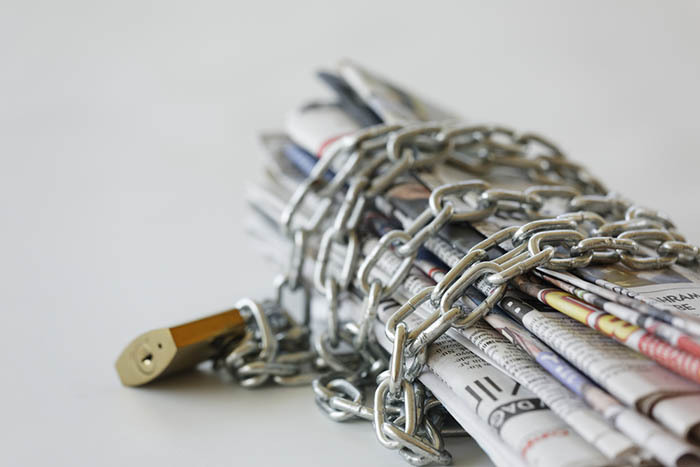 Each week, Index on Censorship’s Mapping Media Freedom project verifies threats, violations and limitations faced by the media throughout the European Union and neighbouring countries. Here are recent reports that give us cause for concern. Three journalists working for Quotidien, a daily current affairs show, were violently ejected from of a conference at Palais des Congrès on 1 February after attempting to ask a question to leader of the National Front party Marine Le Pen, newspaper Libération reported. Journalist Paul Larrouturou, who had an accreditation allowing him to be present during the Salon des Entrepreneurs, attempted to ask Le Pen about claims she had misused European parliament funds to pay her body guards. Larrouturou asked Le Pen: “Was your bodyguard really your parliamentary assistant or…”. The journalist was grabbed from behind before finishing the question. He and two of his colleagues were then prevented from coming back inside by security. However, the journalists said it was a member of Le Pen security who gave the order to expel them. This is not the first incident where the three journalists encountered problems with the Front National. They were assaulted by Front National supporters during the 1 May 2015 party march. Turkish journalist Arzu Demir was sentenced to six years in prison on charges of spreading propaganda for a terrorist organisation through two books she has authored, independent news website T24 reported. The İstanbul 13th High Criminal Court handed down a three year sentence for each book in a trial session held on 26 January. Demir was being tried on charges of “spreading propaganda for a terrorist organisation,” “praising a crime and a criminal” and “inciting the public to commit a crime” in her books Dağın Kadın Hali, meaning The Female State of the Mountain and Devrimin Rojava Hali, meaning The Rojava State of Revolution. Dağın Kadın Hali features interviews with 11 women who are Kurdistan Workers’ Party (PKK) fighters, which is considered a terrorist organisation by the Turkish government. A Turkish court had banned the book and ordered it to be pulled from bookstore shelves on 15 March 2016. The Rojava State of Revolution, banned in April 2016, investigates the current attempts to rebuild in the Syrian Kurdish city of Rojava. “I am glad that I’ve written [these books] and I am continuing to write,” she added. The court did not introduce any possible reductions to the journalist’s sentence on the grounds that she had shown “no regret” for the alleged crime. The Security Service of Ukraine (SBU) raided the flat of former editor-in-chief of Vesti.Reporter magazine, Inna Zolotukhina, in Kharkiv around 7.30 AM on 27 January, Detector Media reported. “I opened the door and a crowd of men entered the apartment. There were seven people, three of them from Kyiv’s Security Service of Ukraine, two from Kharkiv’s Security Service of Ukraine and two witnesses”, Zolotukhina told Detector Media. At the same time, another search was conducted at the journalist’s mother’s house in Brovary near Kyiv. Later Zolotukhina wrote on her Facebook page that she had been interrogated by the SBU as a witness on 30 January. According to the journalist, the questioning lasted from 10.00 to 18.30. “I have signed a non-disclosure agreement, so now I can’t say anything”, the journalist wrote. The search and interrogation were linked to a criminal case on separatism brought against unidentified persons at Media Invest Group holding which publishes Vesti Newspaper and Vesti.Reporter Magazine. Many journalists and employees of the holding have been interrogated in connection to the case. On 25 January a court in Baku sentenced journalist Fuad Gahramanli to 10 years in prison, Institute for Reporters’ Freedom and Safety reported. The case is related to the armed incident between religious group, Muslim Union Movement, and police officers in the village of Nardaran where six people died, including two police officers. Fuad Gahramanli is not a member of the religious group but was accused of promoting them on Facebook, where he urged people not to abandon the MUM’s leader and to continue protesting, IRFS reported.